A master of speculative fiction proves that literature can show us our future—if we look.She is a Booker prize-winning author of over fifty books, including The Handmaid's Tale. 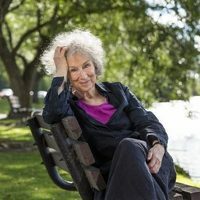 Margaret Atwood has long been a literary titan, but “current events have polished the oracular sheen of her reputation,” says The New Yorker. With her 1985 novel The Handmaid’s Tale back on the bestsellers lists and its television adaptation awarded eight Emmy Awards, it seems Atwood’s sharp eye is more necessary—and prescient—than ever. “Every totalitarian government on the planet has always taken a very great interest in women’s reproductive rights,” says Margaret Atwood; a disquieting insight at any time, but particularly in today’s portentous political landscape. Just as it did when it was published, the story of The Handmaid’s Tale—a future where women’s reproductive rights are governed by a conservative (and patriarchal) administration—is unearthing chilling patterns to an uneasy public. Two blockbuster television adaptations—first The Handmaid’s Tale, then Alias Grace—have meant that Margaret Atwood’s vision is reaching a wider audience than ever before. The Handmaid’s Tale received 13 Emmy nominations and eight awards—including for Best Drama. Atwood herself received a standing ovation. Alias Grace, now streaming on Netflix, is based on Atwood’s Giller-winning, Booker-shortlisted murder mystery, and is notable for being written, produced, and directed by women. A winner of many international literary awards, including the prestigious Booker Prize, Arthur C. Clarke Award, Governor General’s Award, the PEN Pinter Prize, the Ivan Sandrof Lifetime Achievement Award from the National Book Critics Circle, and a Guggenheim Fellowship, she is the author of more than fifty volumes of poetry, children’s literature, fiction, and non-fiction. She is perhaps best known for her novels, which include The Edible Woman, The Robber Bride, The Blind Assassin, Oryx and Crake, and The Year of the Flood. Her non-fiction book Payback: Debt and the Shadow Side of Wealth, part of the Massey Lecture series, was made into a documentary. Her novel, MadAddam (the third novel in the Oryx and Crake trilogy), has received rave reviews: “An extraordinary achievement” (The Independent); “A fitting and joyous conclusion” (The New York Times). The trilogy is being adapted into an HBO TV series by celebrated filmmaker Darren Aronofsky. Atwood’s most recent collection of short stories is Stone Mattress. Her most recent novel is Hag-Seed, a modern retelling of Shakespeare’s The Tempest. Atwood’s work has been published in more than 40 languages, including Farsi, Japanese, Turkish, Finnish, Korean, Icelandic and Estonian. In 2004, she co-invented the LongPen, a remote signing device that allows someone to write in ink anywhere in the world via tablet PC and the internet. She is a founder of ther Writers’ Trust of Canada and a founding trustee of the Griffin Poetry Prize. She is also a popular personality on Twitter, with over a million followers.